It is not every day that someone from Thailand visits the Falklands, so when I returned in March this year from a trip to the Islands, a friend and colleague from the journalistic community here gave me an old, framed map that he had bought in an antiquarian bookshop in Copenhagen several years ago. It was a nice gift and a beautiful map - but it turned out to be more than a decorative print to hang on the wall. In fact, it could refute Argentina’s claim that the Falkland Islands were originally called the Malvinas and later stolen from them by the British. 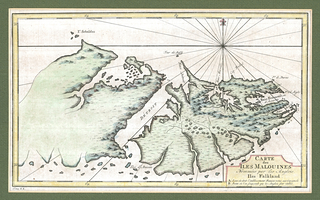 The map legend identifies ‘A’ as “Lieu où étoit l’établissement François remis aux Espagnols,” or “Places where the French were established and (which were) handed over to the Spaniards.” There is an ‘A’ on the northern shore of Baie Françoise, which today is called Berkeley Sound. This is Port Louis, the very first settlement on the Islands, which was established by the French on April 5, 1764 and named after the then French king, Louis XV. Until then, the Islands had been uninhabited, but already called the “Isles Malouines” by the French. In the early 18th century, French explorers had encountered the islands on their way around Cape Horn to the Pacific. Many of them had set sail from the French port of St Malo, hence the name, which first appeared in the 1720s on maps drawn by the French royal cartographer Guillaume Delisle. Bougainville was the first to establish a settlement on the islands and the colonists quite naturally used the name that already existed on official maps. The new settlement was small and initially comprised only 29 persons under the command of Bougainville’s cousin, Bougainville de Nerville. Nevertheless, it made a good start, and Bougainville returned to France to gather further supplies and recruit more settlers. On arriving once more on the Islands he reported: “On January 5, 1765 I saw my colonists again, and I saw them healthy and happy.” In March 1767, the number of settlers - many of whom were Acadians, descendants of French colonists from Canada’s maritime provinces - peaked at 135. But the French had to give up their Isles Malouines because of pressure from the Spaniards, who claimed the islands belonged to them by virtue of the Treaty of Tordesillas of 1494, which had been agreed upon by the Spanish and the Portuguese to clear up confusion on newly discovered land in the New World. A line had been drawn through the mid-Atlantic, and Spain would have possession of any unclaimed territories to the west of the line and Portugal of any unclaimed territory to the east of the line. West of the line, Portugal was only given possession of Brazil. 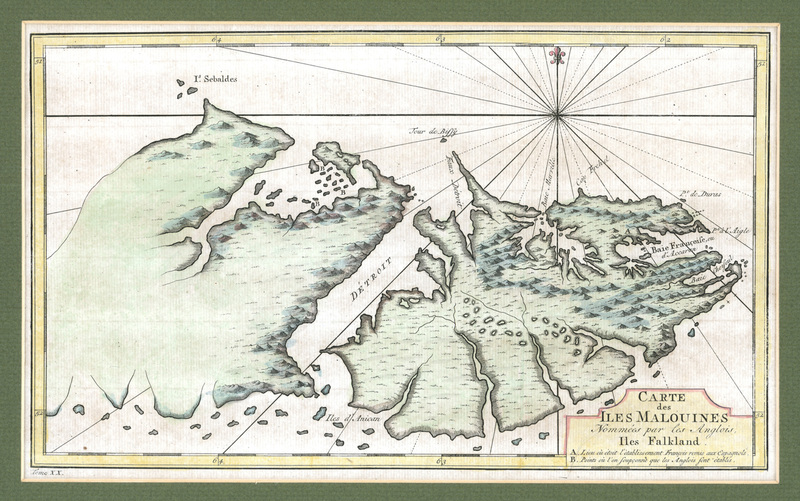 Spain claimed that the Isles Malouines were within the part of the world they had been allotted under the treaty, and asked the French to leave. Bougainville was furious, but, on April 1, 1767, Port Louis was handed over to the Spaniards, who renamed it Puerto de la Soledad, “Port of Solitude,” and placed it under the jurisdiction of the Spanish Captain-General of Buenos Aires. The settlers, who had been brought there by Bougainville, were given the option of staying on under Spanish rule, or returning to France. Nearly all of them chose the latter. It is, however, evident from the map that neither the French nor the Spaniards after them had any clear idea of what the entire archipelago looked like. Only northern East Falkland is properly mapped; Lafonia is seen as part of the same landmass as the rest of the island. The French and the Spaniards were apparently unaware of the deep inlets now known as the Choiseul Sound and Brenton Loch, and which almost separate Lafonia from the rest of East Falkland. Only the eastern coast of West Falkland is mapped; the remaining parts of the island are hazy except for three ‘Bs’ off the northern shore. “B”, the map legend explains: “Points où l’on soupçonne que les Anglois sont établis” - “Places were we suspect the English are established.” The three ‘Bs’ are on and around Saunders Island, the site of the first British settlement on the Falklands, Port Egmont, which was established in 1765, a year after the French had founded Port Louis. The British evacuated those settlements in 1774, but left behind a plaque to mark that they had not relinquished their claims to the islands. The Spaniards abandoned Puerto de la Soledad in 1811 at the time when their South American colonies had risen in revolt against Madrid’s rule. The Islands then remained uninhabited until 1826, when a merchant of Franco-German origin, Louis Vernet, sailed to the island with his family and about 40 German and English colonists who settled at the old colony of Port Louis/ Puerto de la Soledad. Vernet had the authority of the United Provinces of the River Plate. Argentina, as we know it today, did not yet exist; it came into being with the bloody conquest of Patagonia and the country assumed its present name in 1853. Vernet’s settlement grew to become a thriving little colony of some 90-100 people, including some gauchos who had been brought in from the mainland. In 1831, however, Vernet was forced to go to Buenos Aires to answer charges of obstructing American sealing vessels. Shortly afterwards, the American corvette Lexington destroyed the settlement’s guns. The Americans declared the Islands, “Free of all Government,” and removed Vernet’s agent, Matthew Brisbane, to Montevideo. The community was effectively left with no leadership, and infighting broke out among the settlers. In October 1832, Buenos Aires sent an interim commander, Don Juan Esteban Mestivier, but he was murdered on November 30, when his second-in-command mutinied and incited other members of the garrison to violence. By the time the British intervened in January 1833 to reassert their claim to the islands, Vernet’s settlement had only 36 civilians and a garrison of 26 soldiers, who had been there for less then three months. The garrison was expelled but the settlers were told that they could remain, or return to the mainland. Most of them stayed, but more trouble was to come. Brisbane had been released through the intervention of British Consul General in Montevideo, Woodbine Parish, and had returned to the islands. But then, on August 26 1833, a gang of gauchos led by Antonio Rivero ran amok in Port Louis. Several settlers, among them Brisbane, were killed. In January 1834, another contingent of British arrived, and eight gauchos, who had taken part in the murders, were apprehended and sent to England for trial. It is, therefore, hard to take Argentina’s claims seriously. “Malvinas” is just a Spanish adaptation of the name the French gave the islands. Moreover, most Falkland families have lived on their islands longer than the vast majority of Argentine ones can claim to have been in their country. Argentina, too, is a country of settlers of mostly European descent.